In a dark corner, beneath the edge of a mountain, lie a little Dzed. The alien, whose ancestors had arrived on Earth only a century ago, was hunting. He was hunting in the dark, as all his kind do. His vicious arachnid form, extremely suitable for trapping and the silencing of his prey, hung from the top branch of an oak tree. The man, a native of the land, dark skinned and rough natured, walked over the trap, without hesitation. He was not aware of the trap being there, yet he was not afraid of such a possibility. He was a hunter, and for him, it meant that danger was a casual thing. 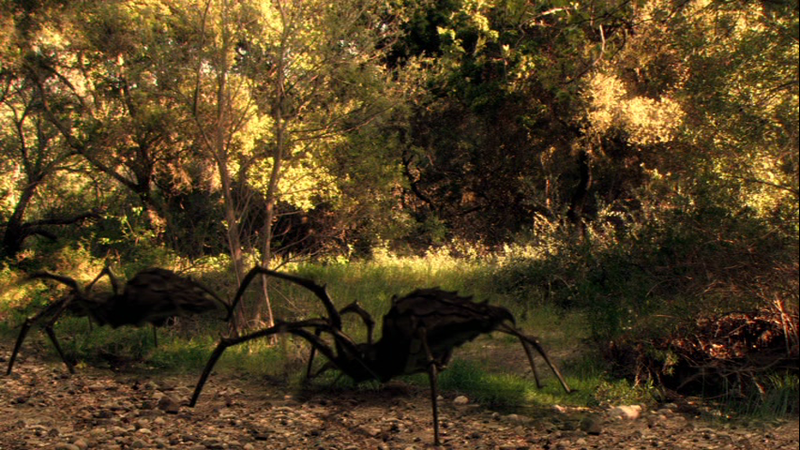 Giant alien spiders are our friends. Just as the Dzed activated his trap, contracting the wires of his immense weave, the man jumped. As the man fell out of its' way, and rolled back on to his feet, a roar filled the night, behind him. Inside the Dzed's web, a large cat with pointed ears was wrestling with the arachnid's device. Needless to say, it was a futile attempt. The man looked up the tree, where the trap connected to higher branches. A shadow loomed against the star-filled sky. The man knew it to be a Dzed. Shaming the hunter, the Dzed did not even consider him worthy prey. Real prey, for the mighty arachnoid, had to pose a real challenge.